Previously in my Century Square Food Trail post, I've mentioned that I'll be doing individual review posts on the restaurants I've visited and here's the first one coming up! 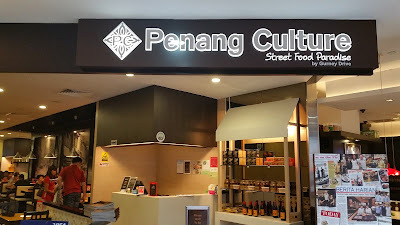 Located at level 4, beside Kenny Roger's, Penang Culture has been operating in Century Square for a while till date and I'm rather embarrassed to say that as a Tampinesian, I didn't notice them until I went on the food trail! The restaurant is simple, with a slightly vintage feel to it (you can see it in the floor tiles) and is big and spacious like how a family restaurant will be. And with that. let's get on with the food! Well, I was expecting a pot of braised pork, and was surprised when it turned out as ngor hiang! Crispy on the outside with savoury and flavourful minced chicken meat inside, the lack of pork didn't effect its taste at all. Pairing up with a good dip of chili, this is just the dish to go for if you're not a fan of the distinctive 'pork smell' like me. I'll find the satay, albeit flavourful, is a little too tough and dry (I took the mutton) and the squid a little too rubbery. The disappointment of being slightly overcooked aside, the taste still packs a punch. The sambal, though not exceptionally spicy, is still strong enough to give a comfortable spiciness as you chew, with a slight hint of sweetness in the aftertaste. I'm not a fan of assam laksa at all, for I don't appreciate the sourness of the dish. But I love the extremely chewy (QQ) noodle that resembles the mouse tail noodles, which apparently is a characteristic of the dish. I so want to fish out the noodles and dunk them in the prawn mee soup! HAHA! Once again, I was expecting something close to our popular local delights, Hokkien Prawn Mee, but was surprised to see a bowl of prawn rice noodle soup. Needless to say, the kway tiao (rice noodle) was soft and smooth, and the broth flavourful with the sweetness of the prawn heads and chicken bones that were used to boil it. With a quick mix in of the chili paste, this yummy bowl of prawn mee is complete! After munching down a few pieces of it, I still couldn't really tell that they're mantis prawn. But who really cares when the taste is absolutely heavenly? The battered, fried pieces of the mantis prawns were then tossed in a savoury black pepper sauce that is so delicious! This will totally go well with a bowl of rice, I'll tell you. As mentioned in my food trail post, this is my favourite dish at Penang Culture for the day. Those crispy fried bits you see covering all over the kway tiao are actually fried salted egg bits, which added to much texture and flavour to the savoury, soft and slightly chewy fried kway tiao that's tossed in generous serving of seafood. I'm not a fan of coconut, but this drink is still pretty okay for me. It's more towards the refreshing taste of a coconut water than the heavy creamy texture of milkshakes in general. This is like a less acutely sweet version of the rambutan cocktail blended up with ice and served to you as it is. A really good choice, even if you're not really a big fan of rambutans. The food looks so sumptuous dear. Why do you post such yummy posts all the time? Craving for these now. The prawn and crab dishes look so delicious. They seems to have verity of food, a really good place for food lovers. Lovely post. Woahh!! The food in Penang looks soo yumm! I'll visit Penang only taste its food. prawn BBq and Laksa, two of my favorite dish! Seems the restaurant has many delicious food on their menu! i miss all penang cuisine, kwetiau and ifumie is my favorite! noodle cook in penang are the best! Everything looks so yummy but seems very expensive for the amount that you get.